Titsey is one of the largest surviving historic estates in Surrey. It dates back to the mid 16th century, though the first impression now is of a comfortable early 19th century house in a picturesque park, lying under the North Downs which hereabout rise to over 270ms. 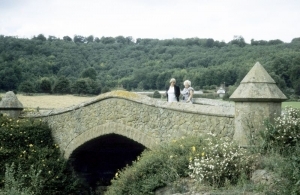 The surroundings of Titsey, as they are today, are largely the work of William and Granville Leveson Gower in the 19th century. They planted the park and laid out the garden. It is difficult to believe that this well preserved stretch of countryside is barely 20miles from the centre of London: only the M25 motorway intrudes into a landscape which otherwise has hardly changed in the last hundred years. The estate was originally bought in 1534 by Sir John Gresham, of the famous London merchant dynasty, and descended in the early 19th century through the female line to the Leveson Gowers, a cadet branch of the family of the Duke of Sutherland. The Leveson Gower family lived at Titsey until the death of Thomas Leveson Gower in 1992. He had been a bachelor with no close relatives and so had set up the Titsey Foundation, a charitable trust, to preserve the estate for public benefit. The gardens have always been a particular feature of Titsey Place and have been enjoyed by many generations. Recently, much work has been done to improve and enhance them. House, garden and re-created kitchen garden are now opened to the public in the summer, and miles of well-marked walks on the side of the North Downs are frequented by more than 20,000 visitors a year. The surroundings of Titsey, as they are today, are largely the work of William and Granville Leveson Gower in the 19th century. They planted the park and laid out the garden. William Leveson Gower was responsible in particular for the hillside beech plantation, which covers 90ha and is such a feature of the setting of the estate, and for the ha-ha in front of the house. In the 16th century the surroundings were very different. The village of Titsey, including the church, a mill and malthouse, was situated next to the house where the formal lawn and flower gardens are today. The church of St. James was moved to its present site on the other side of the turnpike road by Sir John Gresham in 1776 when he made a small park. The church was rebuilt by Granville Leveson Gower in 1860-61 to the design of J.L.Pearson, one of the greatest Victorian Gothic Revival Architects. The shingled spire makes a landmark in the garden. Titsey village itself is now a model estate hamlet with picturesque stone and black and white cottages, mainly designed by the local architects Whichard and Walker, though George Devey also supplied designs for a lodge. The original site of the church is marked only by the ancient yew tree south of the house which now presides over the dogs’ graves. Granville Leveson Gower and his wife Sophia were responsible for the terraces with stone steps, and formal beds with box hedges to the south of the house. The gardens have always been a particular feature of Titsey Place and have been enjoyed by many generations. Recently, much work has been done to improve and enhance them. Standing on the upper terrace is the perfect place to enjoy the long views across the Darent Valley, which extends to the beginnings of the South Downs. 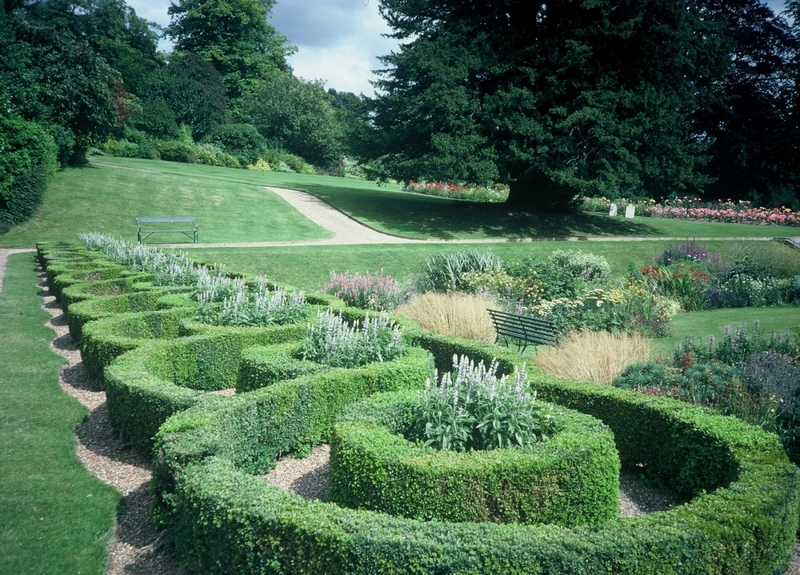 The box link beds were planted over 150 years ago and have been carefully pruned ever since. The fountain at the centre of the lower terrace is a copy of one found in the Cloisters at Eton College. The two herbaceous borders that frame the lower terrace have recently been replanted, and in late summer these are now flushed with vibrant colours. The Golden Jubilee Rose Garden, redesigned and replanted to commemorate Her Majesty the Queen’s Golden Jubilee, was opened by the local Member of Parliament in 2002. In 1996, the walled kitchen garden was completely restored as an illustration of Victorian horticultural techniques. The garden paths were remade, the glasshouses rebuilt, and the garden planted with a wide range of fruit including pears, apples, cherries, quince and figs. Summer annual flowers are grown amongst a wide range of unusual vegetables. Triple cordon redcurrants and gooseberries are trained on the northern aspect of the southern wall. The eastern side is edged with a collection of lavenders. Peaches, nectarines, apricots and grapes are grown in the new (replacement) glasshouses, and two camellias grow up the eastern greenhouse wall. The central conservatory houses a wide range of colourful exotic plants and orchids. Box hedging has been used to quarter the two upper compartments. Two wrought iron gazebos, covered in climbers, stand at the centre of each. The door through the southern wall leads to the wide grass lawn, from which spectacular views can be seen across the park and to the house. The south facing walls are used to grow roses, clematis, honeysuckle as well as more unusual climbers. The path back to the house passes by a long shrub border, under a large holm oak, quercus ilex. In the centre of the garden the spring rises that feeds the water features. It cascades through stone lined channels into a lake with a fountain. This top lake ends at a high cascade made from ‘Pulham’ (artificial) rockwork. The water flows under a large stone bridge built at the end of the 19th century, and into the lower lake. Granville Leveson Gower constructed the island after he had altered the more formal existing water features. House, garden and re-created kitchen garden are now opened to the public in the summer, and miles of well-marked walks on the side of the North Downs are frequented by more than 20,000 visitors a year. All the opening times for the garden are 1pm to 5pm.